Even though I was totally not in the mood to hoop. Even though I will say the hoop has changed my life, it still didn't stop me from dreading the day when I might have to meet people. I was sitting at my window going, "I kinda, sorta wish it'd rain." But I pushed on because the weaker, pre-hooping Shannon would have just not showed up. I packed everyone of my hoops in my car that is a complete mess. After I got in the car, I was like, ugh, I don't have a drink or sunglasses. But surely I will be fine. The moment I get there and pack all 15+ hoops to the spot, I realize that I won't be fine. I left my hair down and I was already super hot. I didn't bring music. I couldn't find any of my drumming music which meant I didn't bother bringing my old boombox. I just didn't feel like it at all. No wonder Paige said the other day that it was so much easier to do spinjam at her house. I tried but I just couldn't pump it up. I felt hot. I felt uncomfortable...and nervous. A group of teens walked by and one girl asked to use the hula hoop. I taught her how and she asked why I had all these hoops. I explained that I was hosting a hoop jam to spread hoop love. She left. I started to feel even more defeated. Not at her attitude. Just probably my attitude and the heat. I sat under a tree when a family came up that had RSVPed on the whole facebook. We started hooping. The mother told me how she first googled Nicholasville hooping when she found my blog and then, my facebook link. <3 It just made me feel like I really was making a difference. We hooped and we compared hoops. Pointers and all sorts of things. I really liked one of her daughters one-handed helicopter as I called it (even though it used both hands...it just wasn't your typical helicopter). I had never seen it before but I feel like that move could come in handy at one point in time. And evidently the small girl was dreading the possibility of rain so much. I felt so bad that I had been wishing for rain so I wouldn't have to go out. 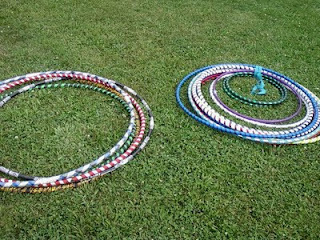 Of course, I did more waist hooping with my flamer to facilitate talking and I didn't want to get freaking hot. I was able to try someone elses water hoop. 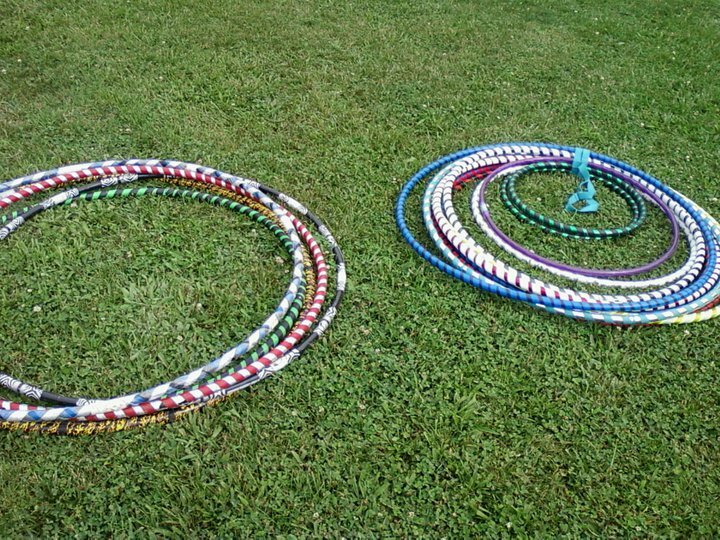 As much as I love heavy hoops, I don't have a water hoop. It felt sloshy. Like moving with it was sloshy. It had such a different groove than my hoops. It really proved that all hoops have a different flow. I might start doing a bi-weekly jam in Nicholasville on Mondays that I have off. I have to get my next schedule to plan the next one. And of course, if we get that place I've been wanting, we'll have a housewarming party that will be a hoop jam with food on my end of the party planning! Maybe next time have a small sign next to us that says, "Free Hoop Jam. Grab a hoop and spin! time-time"
Ya, a sign could be a great idea, that way anyone who might be curious would be given the "permission" to come closer, to ask, to try. I'm glad you went out and did it though. It seems like it was a really good thing to push yourself to do. I don't think I would be able to do something like that yet. I am totally the girl who wishes for rain or just backs out altogether, heh. I like hearing your stories about things like this, the inner struggle about doing it, etc. It's really inspiring, and you're such a trooper. You are really just going for it and doing what you want, putting in the sweat and tears it takes to build something amazing. Thanks! I'm trying my best that's for sure. I now have a sign!